Tere Ghar ke Samne is one of the most enjoyable romantic comedies of Hindi Cinema. It is unfortunate this delightful film is never counted among the best works of director, Vijay Anand, the accolades going to his more obvious works. That is because the film is unfairly looked upon as a cute love story, nothing more. While admittedly the film is a lightweight, frothy musical (and most enjoyable, one might say), it does propagate neighbors living in harmony and looks at issues of the generation gap arguing that everything new needn’t be bad and everything old needn’t be good either. But yes, the essence of the film is the love story. The developing romance of Rakesh and Sulekha is handled beautifully with simple everyday situations (going out for picnics, rides to the country etc), beautifully written scenes, witty spoken dialogue and plenty of charm, both from the script as well as the lead pair. The film is a blend of the urbane, modern and traditional values. The characters are upper middle-class Dilliwalas who go to clubs, parties and the like. While Rakesh and Sulekha may romance each other stealthily behind their father’s backs, when it comes to the issue of marriage, Rakesh is totally clear that there will be no elopement. He will only marry Sulekha with her father’s consent. Say, didn’t the biggest blockbuster of 1995 also rest on this premise??? You know the one – the Shah Rukh Khan-Kajol starrer, directed by Aditya Chopra… But this is not to say the film shoves traditional values down your throat. It shows you both sides of the coin and here it is extremely interesting here to see the characters of the two mothers. Rakesh’s mother rebukes her husband for throwing out their only son because he smokes and drinks once in a while. Not only that, she even confess that she was tempted on taking a peg or two in the club once and also informs him that he is unjustified in believing that like their forefathers, his son should also play the dutiful progeny. She insists that Rakesh means no disrespect with his drinking and smoking and that is hardly any reason for his being thrown out. She goes to the extent of telling her husband that it was his fault that he sent his son for higher education abroad not because he wanted his son to be well-educated but because it added to his prestige of having a son who was ‘foreign returned’. Likewise, Sulekha’s mother tells her better half that he has lost his mind because he bid Rs 2,00,000 for a property worth Rs 40,000 only because he wanted his bid to be higher than Om Prakash’s! 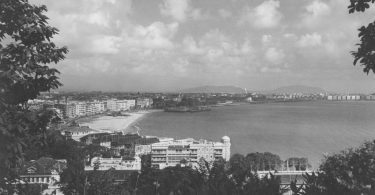 The film makes extremely good use of actual locations of Delhi and Shimla – of construction sites in and around Delhi but some of the matching of sets with the actual location is slipshod. Also, unfortunately the resolution – the climactic speech and song bringing the two fathers to their senses is extremely long winded, preachy and much too serious and melodramatic – totally out of sync with the rest of the film which was so smooth and free-flowing till then. Tere Ghar ke Samne is aided greatly by the two central star performances. Dev Anand is at his stylish best, his star persona, his mannerisms being put to brilliant use as the ultimate debonair, dashing, successful young architect. Nutan compliments him perfectly. She had taken a small break from acting, following her marriage to Naval Lieutenant Commander Rajneesh Behl in 1959 and the subsequent birth of her son, Mohnish in 1961. 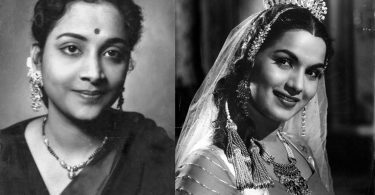 However, she made a major comeback with films as diverse and brilliant as Bandini and Tere Ghar Ke Samne. With both these films Nutan proved what a versatile and matchless actress she was – as a dramatic performer (Bandini) she was right there with Nargis and Meena Kumari and as a comedienne on the other end of the spectrum, she was as good if not better than Madhubala and Geeta Bali. In Tere Ghar Ke Samne, she displays here a lightness and comic timing that’s a delight to behold as with every smile she lights up the screen! The lead players are perfectly supported by Chattopadhyay and Om Prakash as the rival fathers of the couple. Incidentally the girl playing Nutan’s bother Rajendranath’s love interest, Ginny is Zareen Katrak, now better known as Zareen Khan or Mrs Sanjay Khan. 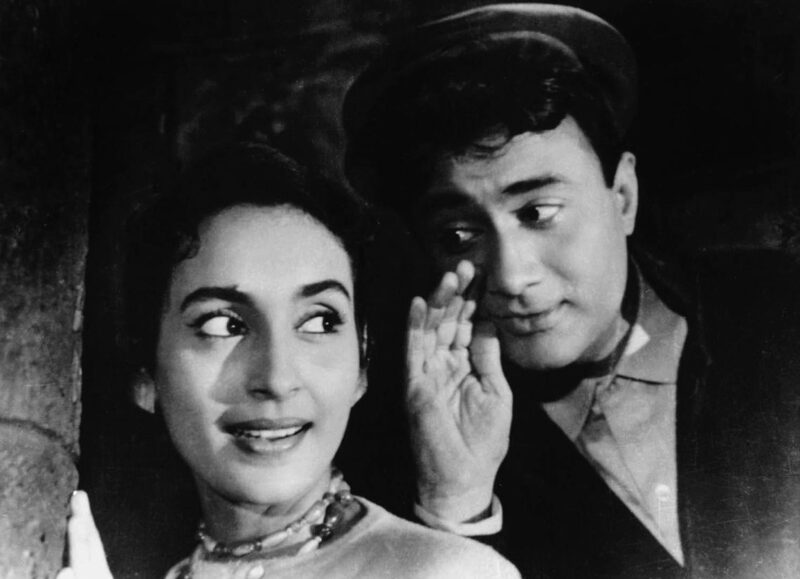 Musically, the film boasts of one of SD Burman’s most popular scores but lifting the film several notches is the way Vijay Anand has picturized the songs. In fact, it can be confidently said that Vijay Anand was arguably the greatest picturizer of songs in the history of Indian Cinema. His use of creating unusual situations and sets, using long complicated takes involving both character and camera movement, incredible use of foreground and background of the frame, dynamic framing with a camera almost always on the move and making the most of tightly enclosed spaces all played a great part in the magic of the songs in his films. The standout songs of the films are Dil Ka Bhanwar Kare Pukar, Tu Kahan Yeh Bata and of course the title song. The filming of Dil ka Bhanwar in particular is mind-blowing – just a set simulating the steps inside the Qutub Minar as Dev Anand and Nutan make their way back down, after beautifully building up their romance to lead into the song as they climb up. As mentioned before, being in a constricted space brings out the best in Goldie. You cannot help but be amazed by the angles, by little camera movements, by the dynamic shot taking! Tu Kahan is the ultimate in romance as Dev Anand searches for Nutan in the misty laden streets of Shimla. However, the song is hampered a little by the not so good mix of sets and actual locations in Shimla. The title song as Dev Anand sings to his glass of whisky imagining Nutan inside the glass is just brilliant. The song has an unforgettable moment when Anand’s assistant, Rashid Khan, puts an ice cube into the glass causing Nutan to shiver with the cold which Dev Anand gallantly takes out! It is indeed a pity that following this gem of a film, Vijay Anand never tried a full fledged romantic comedy again. But then greater challenges lay ahead for him as he entered the best phase of his career with Guide (1965), Teesri Manzil (1966), Jewel Thief (1967), Johny Mera Naam (1970) and Tere Mere Sapne (1971) – masterpieces all!